We had given up the master bedroom of our old house for the child care. 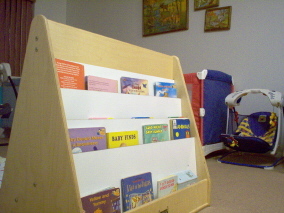 As you walk into the room, you first come to our board-book shelf. I had to move it in here because it was becoming a ladder for the toddlers. The children are allowed to choose books from here throughout the day. In the background you can see our portable infant swing. We move this to the living room or playroom as needed. When the children are in the Nap Room they are supervised or in their beds. The children are always in earshot. The blinds are closed in this room for a restful atmosphere. Each child has his/her own playpen. I keep the infant swing in here so "helpful" toddlers won't be tempted to swing the babies. The cot on the right is for older toddlers. 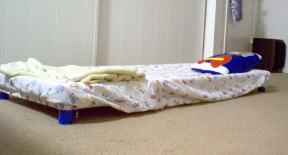 A crib sheet fits great around the cots. 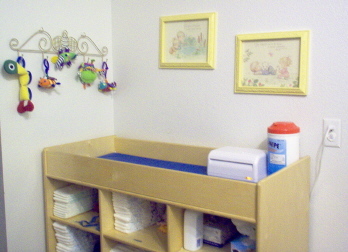 Here's our changing table. I got this through a state grant, purchased at Discount School Supply. It is well worth the investment! I require the parents to bring a large package of diapers, extra clothes, and other changing supplies to keep at Pamm's House. I find this easier than having several diaper bags to retrieve supplies from. 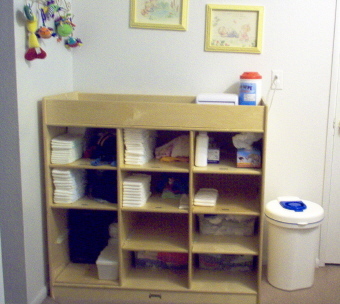 To the right of the changing table is the diaper pail. To the right of that, out of sight, is the sink for quick hand-washing. On the top of the changing table I have a baby wipes warmer. The parents bring a wipes refill each month. I also have disinfecting wipes for wiping down the table after each use. Hanging above the table are toy "bugs." Each child has thier own to hold during diaper changes. 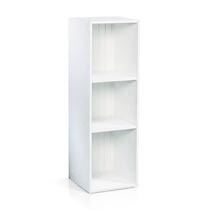 Before I had the nice changing table, I used shelving similar to this from Wal-Mart for the cubbies and a regular changing table. 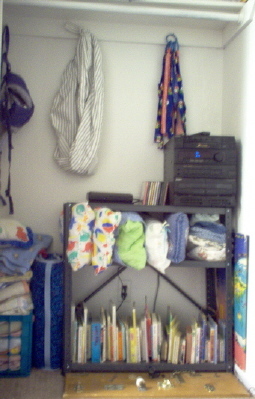 Here's the closet in the Nap Room. The children are not allowed access to this closet. 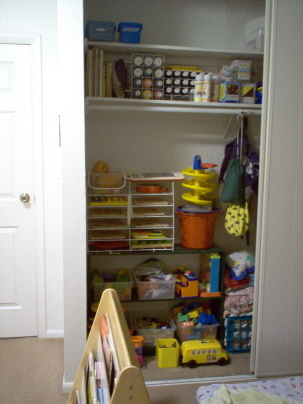 I store art supplies, puzzles, toys, blocks, bedding, etc. in here. On this side you can see our stereo that plays Kenny G and Enya music while the children nap (the speakers are out of the closet). There is also the Baby Sling, Snuggly, spare pillows and bedding, battery charger (we have rechargeable batteries for the swings), gadget board, and our supply of board books. This closet looks impressive, but it's a narrow closet with almost no shelving! I've had to collect shelving and storage containers to make it into what it is now.